Slimey Down Under. This leak had been going on for a while. There was algae growing down there! And water was running down the wall into the basement. It was a real mess! Notice also the partition in the floor. They had a new floor put in IN FRONT of the freaking dishwasher! Hello? Is this thing on? I had to pull the dishwasher outta there to change the upper spray arm water feed tube. Please don’t torture your repair dudes like this! Drippy Action Shot. Watch with amazement and your mouth agape as you witness water suspended in the air before your very eyes! Right now it’s just dripping vigorously. When the dishwasher switches into drain mode, the water comes spraying out in a fan-like multitude of spray, drenching anything nearby. Honestly, I don’t understand how this could go on more than just one time before someone noticed that something was amiss. You shouldn’t see any water from your dishwasher… ever. 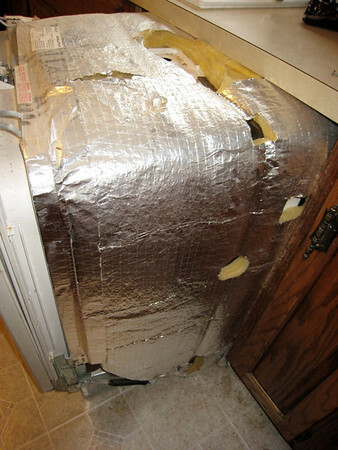 Any regular leak should be checked out quickly. 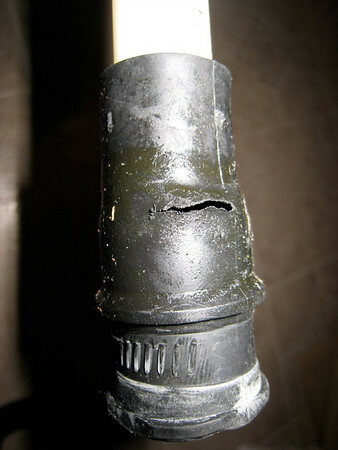 Water-Worn Rubber Fitting on the Old Upper Spray Arm Water Feed Tube. 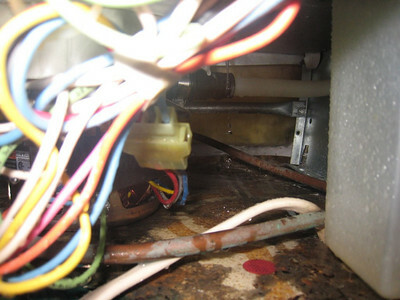 Here be the culprit– this rip in the rubber fitting was caused 100% by water! The pump blasts water though this fitting and tube to feed the upper spray arm. After a while, the rubber gets worn thin and rips. Given enough time, water can dissolve anything. Unscrewing the Upper Spray Arm Retaining Nut. The upper spray arm water feed tube needed to be replaced. 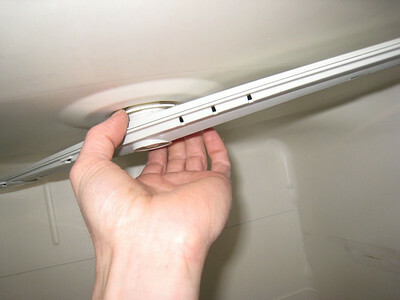 It runs around the outside of the dishwasher to the top where it connects here to the upper spray arm. 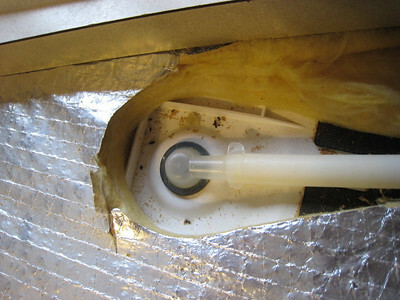 Upper Spray Arm Water Feed Tube, External Top View. This is the top, outside of the dishwasher. Note the mouse droppings. Every house has ’em. Decon is your friend! Upper Spray Arm Water Feed Tube Removed. Notice that the entire dishwasher has to be removed from the cubby to replace the upper spray arm fill tube. 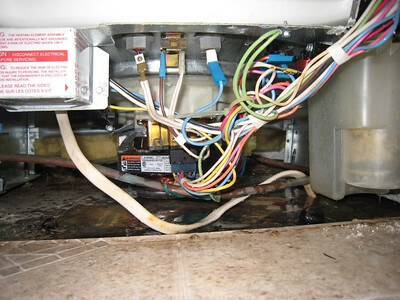 This entry was posted in Dishwasher Repair on May 3, 2009 by Samurai Appliance Repair Man.